Chief Engineer of the U.S. Army, who fought with distinction in three wars. Only Hyman Rickover, the “Father of the Nuclear Navy” served longer than Totten, at 63 years. General Winfield “Old Fuss and Feathers” Scott served 53 years, and generals such as Omar Bradley and Douglas MacArthur all served fewer than 50 years each. June 11, 1808. On vellum. 14¾ x 18 in. March 9, 1811. On vellum. 15½ x 18 in. April 1, 1839. On vellum. 14 x 17¾ in. August 23, 1848. On vellum. 14½ x 17 in. April 13, 1863. On vellum. 14¾ x 19½ in. In 1805, Joseph Gilbert Totten (1788-1864) of New Haven, Connecticut, graduated from West Point and was promoted to 2nd Lieutenant in the Corps of Engineers. He resigned in 1806 to serve as secretary to the Surveyor General of the Northwest Territory. 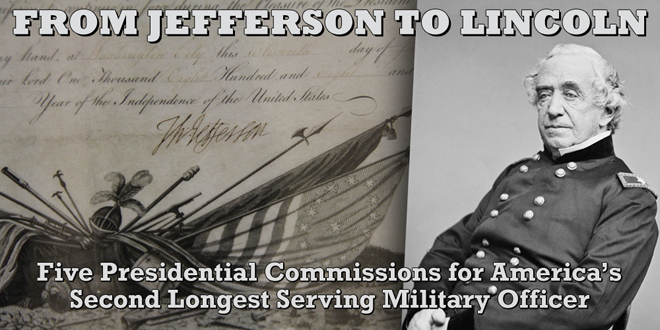 In 1808, Thomas Jefferson reappointed him to his former rank, which began his nearly 56 years of military service (55 years and 10 months, in addition to the 2 years he had already served). Totten’s career in the Corps of Engineers spanned the development of the United States’ coastal defense program. He helped construct New York’s harbor defenses and supervised the construction of Fort Clinton in Castle Garden (now Battery Park), 1808-1812. James Madison promoted Totten to 1st lieutenant in 1811 just before the War of 1812. Madison again promoted Totten, this time to captain, where he was supervising engineer for the fortification of Lake Champlain, the St. Lawrence River, and other coastal defenses. He served in operations on Lake Champlain, the Niagara and St. Lawrence Rivers, and the Great Lakes. He helped capture Fort George in Upper Canada (Ontario), repel the British Fleet on Lake Ontario, took part in the Battle of Plattsburg, and blew up the abandoned Fort Erie, also in Upper Canada. Still under Madison’s presidency, Totten was breveted major in 1813, and lieutenant colonel in 1814, for meritorious service and gallantry, respectively. President James Monroe promoted Totten to major in 1818, and breveted Totten colonel in 1824. John Quincy Adams promoted Totten to lieutenant colonel in 1828. Between 1825 and 1838, Totten supervised the construction of Fort Adams in Newport, Rhode Island, (now the site of the world-famous Newport Jazz Festival). In 1838, Martin Van Buren gave Totten one of his most important commissions to full colonel and Chief Engineer of the Army. Totten continued to build shore defenses and harbor works as well as with the drydocks at the Pensacola Navy Yard. Totten then served under General Winfield Scott at the Siege of Vera Cruz (1847) during the Mexican-American War. President Polk marked Totten’s advancement to a generalship when he awarded him the rank of brevet brigadier general for “gallant and meritorious conduct” in the battle. In 1851, he joined the lighthouse board and began reforming notoriously dangerous designs. His most notable design achievement was rebuilding Boston Harbor’s Minot’s Ledge Light, considered the “most wave-swept structure in North America,” after the first lighthouse was destroyed in spectacular fashion with the loss of both lighthouse keepers. Totten designed a granite-constructed tower, with its first forty feet serving as a massive anchor block attached to the ledge with iron pins and its own enormous weight. 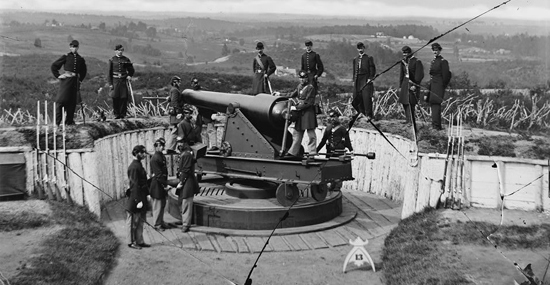 It took five years to construct (1855-1860) and stands to this day. During the Civil War, Abraham Lincoln made the breveted rank permanent by promoting Totten to full brigadier general in 1863. As chief engineer of the army, Totten helped plan the defense of Washington, D.C., including construction of Fort Totten, now a D.C. neighborhood. Totten was breveted a major general for “long, faithful, and eminent services” on April 21, 1864, one day before he died. In addition to his military achievements, Totten was a regent of the Smithsonian Institution, a Corporator of the National Academy of Sciences, and the Harbor Commissioner of both Boston and New York. Three forts bore his name: Fort Totten in Queens, New York, Washington, D.C., and North Dakota.